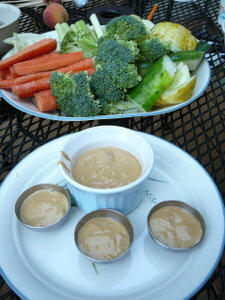 I got a hankering for some peanut dipping sauce, and thanks to the CSA I have a fridge full of veggies just waiting to be munched, so I thought I'd make some sauce and dip the veggies. The sauce may be made 2 days in advance and kept covered and chilled. Makes about 1 cup. I didn't have lime juice, so I dumped in 1/3 cup limeade and 3 T lemon juice instead of the lime juice and water. I don't like soy sauce because it's full of sugar and preservatives and non-soy crap. So I 2 T of Bragg's Liquid Aminos. We affectionately call it "The Spray" because we originally got it in a spray bottle, though now I buy the mega-sized version. The kids LOVE it. I am acquiring a taste for peanut butter late in life! and will try this recipe which sounds yummy. By the way, nice to see this lovely picture of you now. The addition of lime is making my mouth water. Since they love peanut butter, maybe it'll get my kids to try raw veggies. http://www.restaurantbiz.com/index.php?option=com_content&task=view&id=13460 says, "In Chinese cuisine the familiar concept of yin-yang is often brought to bear, the mixing of opposites to achieve balance. [...] there are six different tastes: sweet, sour, salty, bitter, hot/pungent." The sauce seems to combine all six: sugar for sweet, lime for sour, soy sauce for salty, garlic for bitter (sorta), and cayenne for hot. So, any substitution along those flavor groups should work. My mom made her own version using mirin for sweet, Chinese red sauce for hot, and some other herbs for bitter. I didn't pay much attention to exactly what she used since I don't have the same ingredients in my kitchen, but hers was basically the same concept of six balanced flavors on a watered-down peanut butter base as well. i used honey instead of sugar. i forgot to include that as a substitution. i believe i wondered at the time how maple syrup would taste. yeah, i like the balanced idea. it fits. It's a sweet Japanese rice wine with very low alcohol content that's used for cooking. You have to be careful when shopping for it, though; unscrupulous companies will bottle corn syrup with some random vinegar or what not and call it mirin (or "mirin-flavored seasoning" and other euphemisms). The fake stuff doesn't have the same flavor, but if so many companies are doing it and getting away with it, I guess there are enough consumers who can't taste the difference -- or actually prefer corn syrup. I think mirin is an acquired taste. i believe i wondered at the time how maple syrup would taste. Mmm... That sounds good. From the ingredients alone this so doesn't sound appetizing, but peanut butter always conquers all, so I'm in for giving it a whirl. you're high in the head man. this stuff could make cardboard taste like the food of the gods. it rocks on every plane in the universe. make it and tell me it isn't so. Peanut butter has that ability all on its own. This looks so great. I think this would be great after a day of grilling splashed on some chicken and maybe even with some grilled veggies. Has anyone tried this with anything other than veggies.